Glorious reds, yellows, oranges and greens to be seen. Everywhere! 2:00 pm - Visit Sonnenberg Gardens & Mansion State Historic Park, one of America&apos;s longest surviving estates from the Victorian Era. The elegant Queen Anne-style mansion was built in 1887 by New York City financier Frederick Ferris Thompson. A docent led tour including a visit to nine formal gardens and several greenhouses is truly a delight. Finish your tour with a visit to The Finger Lakes Wine Center featuring wines from more than 40 partner wineries from the Finger Lakes. Explore an 1816 Federal Mansion & Carriage Museum featuring a remarkable collection of over 100 horse-drawn carriages and farm implements. This mansion was built for Gideon Granger, Postmaster General for Presidents Jefferson and Madison. Check into your hotel, freshen up and then head out for a delightful evening. Experienced group friendly Hotels in Canandaigua or Geneva for your overnight stay. Several local restaurants offer creative and tasty menus and dinner. 5:30 pm - A wonderful experience awaits at the Holiday Inn Express, right off of Canandaigua Lake, with close proximity to Main Street and some of Canandaigua&apos;s best restaurants. 8:30 am - Travel the scenic route along Rt. 21 towards Naples, NY. 9:00 am – Pick up Grape Pie at Monica’s Pies. 10:30 am – Shopping at Artizanns. With over 200 Finger Lakes artisans present everything from pottery, and hand-blown glass, to woodworking, jewelry, and tasty food products. Everything is made by local Finger Lakes artists and with such a wide selection you&apos;ll be sure to find the perfect present to bring back home! 12:00 pm - Your visit to Arbor Hill Grapery will truly be memorable. A guided tour by the winemaker himself will add just the right ‘taste’ to your Finger Lakes tour. Sample wines, browse the gift shop and then enjoy lunch at Brew and Brats. The beer tasting is a pleasant surprise too! Tour and meet more than 90 alpacas and new babies on a 180-acre farm with unique landscapes and beautiful gardens. Alpacas produce a fine and highly-prized fiber, so be sure to visit the Alpaca Country Gift Shop, stocked full of unique, high quality alpaca clothing, souvenirs, bears and more. Creativity has no limit at the Wizard of Clay near Honeoye. A unique pottery and shop located in geodesic domes you will find an incredible display of custom made fun and functional pieces to decorate every room in your house. The Wizard’s pottery has been a signature keepsake in the Finger Lakes for many years. 5:00 pm - Arrive back at your hotel to freshen up before heading off to dinner. OPTION 1 - head over to the New York Kitchen where all things New York State are featured. Enjoy a culinary demonstration, hands on lessons, wine tasting, a great New York State shopping experience AND you might just stay for a wonderful dinner as well. OPTION 2 - Spend the evening on our stellar Canandaigua Lake aboard the Canandaigua Lady. Enjoy dinner and a cruise around the lake on this lovely 19th century steamboat replica and authentic double-decker paddlewheeler. 9:00 am - Check out and departure from Canandaigua. 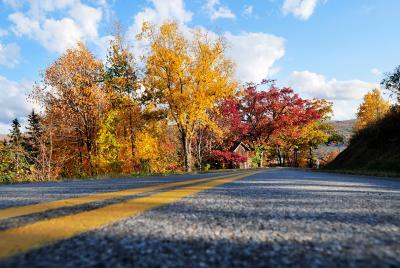 Travel along scenic routes, all offering glimpses of our astounding autumn foliage. Arrival at Letchworth State Park, known as the “Grand Canyon of the East.” This state park is over 1700 thousand acres of foliage beyond your color expectation. Secure a park step on guide that will enhance your experience by providing details on the history of the park, its namesake and philanthropist William Pryor Letchworth and offer a detailed understanding of the ‘flora and fauna’ that makes this park a true gem. Several photo opportunities along the way and options for lunch stops before heading out and on your way home. A true “Finger Lakes Experience” awaits at Belhurst Castle. You’ll be treated to a wine tasting at Belhurst Winery followed by lunch at Edgar’s restaurant in the unmatched beauty of a century old historic castle overlooking Seneca Lake.